In 2002/2003, the main reason First Nations children aged 0 to 11 years living on reserve visited a dentist was for a check-up or a cleaning. Restorative treatments such as filling cavities tend to increase as children age. 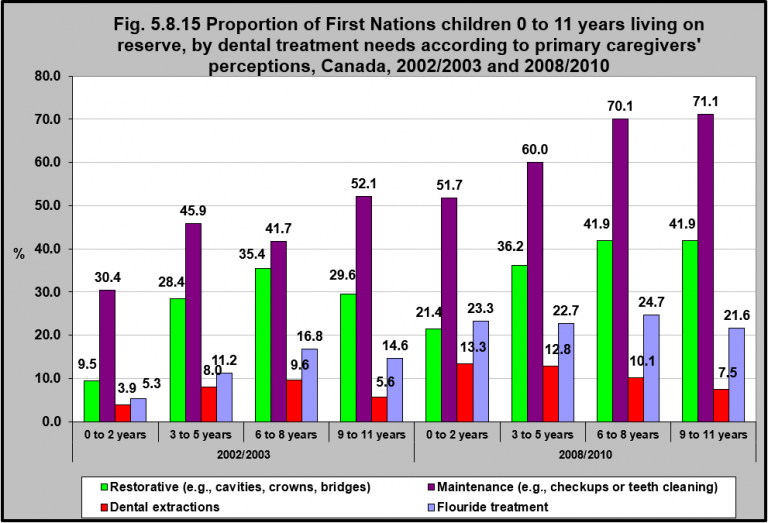 The number of First Nations children age 0 to 2 living on reserve having dental extractions increased from 3.9% in 2002/2003 to 13.3% in 2008/2009. Restorative treatments for this age group also increased significantly from 9.5% to 21.4%. Healthy baby teeth are required for chewing food, developing speech and communicating, and for ensuring there is adequate space in the jaw for adult teeth. However, early signs of tooth decay often go unnoticed or untreated because of the misconception that because baby teeth are not permanent, they do not require extensive oral health attention.1 As such, as children age and their permanent teeth begin coming in, oral treatment needs increase. 1BC Aboriginal Childcare Society. (2007).